What is true for works of art which are deeply affected by the historical context, clients, political relationships, customs, bonds, morals, etc….., is valid for lace too which is the result of a continuous evolution and not just part of a lost art which can only be reproduced. In 1939 Coco Chanel wrote: “unlike many other precious objects which, owing to industrial progress, have lost much of their luxurious quality, lace, adapting itself to the economic and industrial requirements of our age, has kept its main characteristics: precious elegance, lightness and luxury”. We can say that embroidery is an age-old art, even if the popularity of embroidery in white is quite recent (starting from the 18th-century neoclassical period) and has changed greatly in time (in the past coloured embroidery, which also included the use of gold and silver threads, pearls and precious stones, was performed exclusively by men), lace, on the contrary, originated in the 15th century and was a direct evolution of the drawn thread work. In practice, the research of new embroidery techniques and effects and the Renaissance experimentation, brought to wider and wider unthreaded spaces between weft and warp, in order to have larger parts to fill in with embroidery; until someone realized that it was possible to create a new marvel “from nothing” needless of any fabric support. Obviously reticella was fundamental for the appearance of needle lace and it was also the turning point in the transition from drawn thread work to real lace. It still presented the orthogonal framework of weft and warp and very geometric decorative motives both because they were typical of the early Renaissance iconography and because they were easier to make. 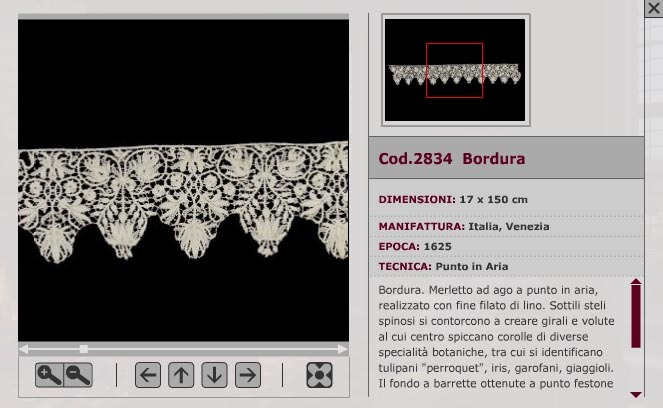 Only when the first real type of needle lace, il punto in aria (stitch in air), became popular, it was possible to create the first flowery motives and the amazing folds of very large ruffs which became very common between the end of the 16th and the beginning of the 17th century, still having reticella as an internal support. The “needle” technique was immediately followed by the appearance of bobbin lace (made by twisting several threads, while the weaving is held in place with pins set in a lace pillow) whose results were equally valuable. 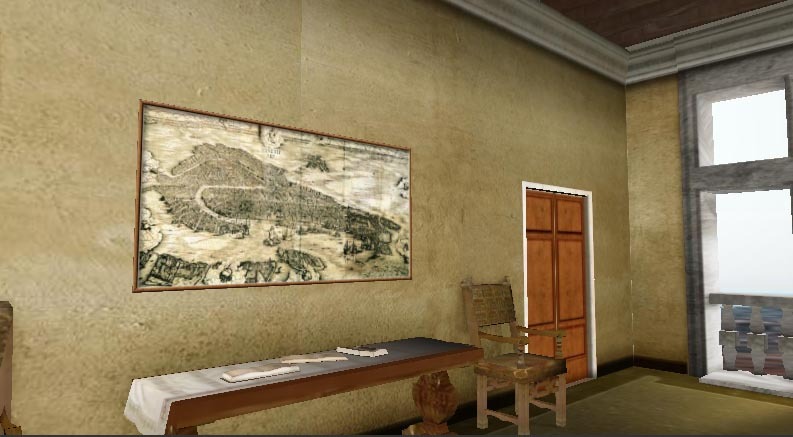 The two techniques have always enjoyed great popularity, with one temporarily outstripping the other owing to the fashion requirements and the culture of the period. 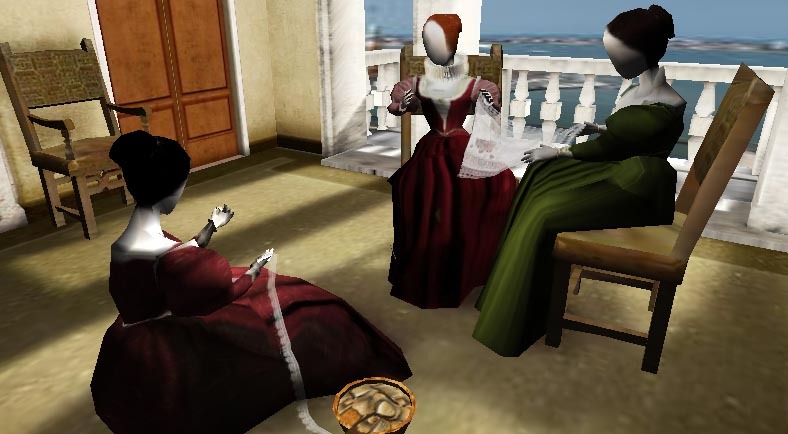 Scene based on Jacopo Strada’s 16th-century engravings, symbolizing the first appearance of lace. 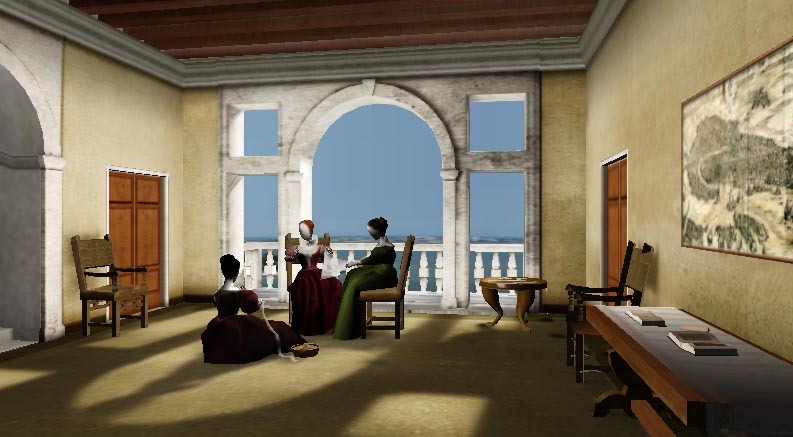 Under the “portego” (porch) of a Venetian Palace (the representation hall on the main floor, open on both sides) three girls are engaged in an embroidery and lace job-pastime. One in particular is drawing threads out of a piece of material, while the others are looking at the reticella hem of a small tablecloth.